If you are thinking about making the courageous decision to enter drug and alcohol treatment to get sober, then you have mentally taken the first small step in what will be many changes to come. But is going to rehab only about getting sober, or is it a lot more than that? Entering a drug detox and gaining sobriety from drugs and alcohol is only the beginning. The truth is that getting sober is much more than that. At its core, the decision to get sober is not about stopping the substance abuse, but about moving on from the past. This is easier said than done. In fact, much of the reason a person abused drugs or alcohol in the first place is due to shame, usually about themselves. They might feel “less than” and not worthy of the great life they see others around them having. The shame people feel for anything that has happened in their lives can self-perpetuate with the use of alcohol. We sometimes use alcohol to fill the emotional hole that exists, leading to more shame about ourselves. If you are or were an active alcoholic or addict, you probably feel shame for many of the different things that you have done. You might have stolen something, lost your job, cheated on a significant other or something else. We have all made mistakes in our lives, whether or not the person is an addict or alcoholic. The point is not to dwell on those things because they cannot be undone, and they do not define you as the person you are sober. To further drive this point home, you may feel like a great person and you are, except when you drink. It is very important to remember that being addicted to alcohol or drugs does not mean you are morally bankrupt. It is a disease, a chronic illness that requires treatment, like any other medical condition. It does not make you a bad person, but it is easy for many to feel that way regardless. There will never be any hope for healing if you hang onto the anger and shame for what you once did, but are no longer doing. You may also feel guilty, which is a good thing because it means that you know the difference between right and wrong, but if you don’t deal with it, you will experience resentment and anger and the whole cycle repeats its self. First, we have to face what we have done. This means taking responsibility for each thing you feel ashamed of and doing your best to make it right. This could be apologizing to someone you have wronged or paying back a debt to someone. Once you have done everything you can in this regard, it becomes much harder for you to feel shame about it. Doing this allows us to move on to the other things we need to do, such as asking for forgiveness. 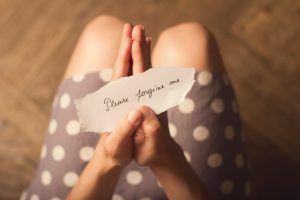 Whenever necessary, apologizing requires us to eat our pride and be humble, which is the opposite of what may have previously done. This is called moving on. Whether you are just entering drug detox for the first time, or have been sober for years, the most important thing you can do to break the cycle is to be honest yourself. When you start to lie to yourself, you drift back into the lull of addiction and the cycle it brings. Addicts and alcoholics experience shame easier than others, so it is important that you continually strive to do the right thing so that you don’t have to feel that way. You can only take your own next best step. If you are honest and listen to yourself when presented with a compromising situation, you can take the right action. If you are continually trying to be your best, there is nothing to ever feel ashamed of again.